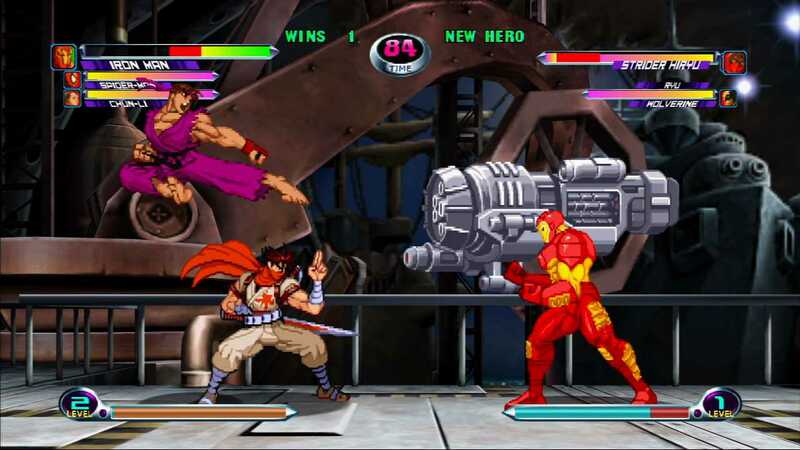 Players select three fighters from the roster of Marvel and Capcom characters and fight one-on-one until one of the teams have no remaining players or time runs out. If each player has at least one character remaining when the timer runs out, the player with the highest total health amongst their remaining characters wins. Each character has at least one super combo and the entire team shares a single super meter. The characters can draw on this (at a minimum cost of one level) to perform their super combos or other special super moves. Up to five levels of the super meter can now be stored during a fight. Players can tag out their characters at any time, switching control to another character while inactive characters can gradually recover some health. Game Analysis Players select three fighters from the roster of Marvel and Capcom characters and fight one-on-one until one of the teams have no remaining players or time runs out. If each player has at least one character remaining when the timer runs out, the player with the highest total health amongst their remaining characters wins. Each character has at least one super combo and the entire team shares a single super meter. The characters can draw on this (at a minimum cost of one level) to perform their super combos or other special super moves. Up to five levels of the super meter can now be stored during a fight. Players can tag out their characters at any time, switching control to another character while inactive characters can gradually recover some health. Copyright © 2014 - 2019 SocksCap64, All Rights Reserved. Logos, Trademarks, Pictures Belongs To Their Respected Owners. Powered By WordPress. 102 Queries in 0.563 seconds.